On August 1, 2010 IKEA stores in North America will being phasing out the sale of incandescent light bulbs and by January 1st, 2011 IKEA will stop selling them all together. Here's the link to IKEA's press release. IKEA's move makes it the first US retailer to end its sale of incandescents and it's doing so a year ahead of the federally mandated timeline to begin. As I understand it, the mandated timeline in the US is a phase out that starts in 2012 and ends the sale of incandescents all together in 2014 and please correct me if I'm wrong. Frankly I applaud them just as I applaud the move away from incandescents in general. I made the switch several years ago and the difference in my electric bill was as obvious as it was instantaneous. Then again, I don't have any light fixtures that feature exposed, decorative bulbs. Have you guys given any thought to this scheduled phase out? Do you plan to make the switch or do you plan to stockpile incandescents before they're gone for good? Is this news? I'm very fond of the warm-tone CFLs I use and if enough people would find it useful, I'll start rerunning my earlier material about how to buy a warm CFL. On second thought, here's a breakdown of lumens, footcandles and degrees Kelvin. In the meantime though, is this a good thing or a bad thing? Is IKEA's phase out too soon or is the rest of the country's too late? We have a national phase-out going on. Our energy companies have run free or cheap services where a handyman comes out to your house and replaces all your light globes. Unfortunately, the replacements are cheap, blue-toned CFLs. Then they hand you your bag of working incandescents... we've been using the incandescents up then continuing with CFLs. There is a great deal of interest in LEDs at the moment, especially to replace halogen downlights. And our traffic lights are all LEDs too. My tip: Mirabella is crap. Short lifespan, bad colour. Buy your CFLs at the hardware store, not the supermarket. Thanks for the update Chookie. I knew that Australia was leading the pack so far as the incandescent phase out goes. Mirabella is an Australian brand, are they getting some kind of preferential treatment during your mandated phase out? I've been using a brand sold in the US called Ecosmart. Ecosmart is a house brand of Home Depot (a home center chain in North America, South America and China). I started buying them because they list the temperature of the light in degrees Kelvin right on the package. The problem with fluorescent lighting for some of us is that it tends to flicker. I get headaches from it if I’m obliged to spend any length of time in a room lit only by fluorescent lighting. A couple of years ago my contractor buddy finally talked me into letting him wire my shop for fluorescent lighting, and I have admit that for the same amount of money expended, I have a much, much better lit shop. Absolute night and day—literally. But before he wired it, he asked me my objection. I told him, and we kept a handful of incandescent bulbs. They create a steady stream of light, and just a few of them counteracts the flickering of the fluorescent. That flickering is not noticeable even to me, but it’s there, and it has a most adverse effect on me. But with a judicious compromise, I am able to get along just fine. Will the government also wave a wand to eliminate the flickering of those lights? If not, how are those of us who are sensitive to that kind of lighting supposed to get along? Fluorescent lights do indeed flicker, that's part of the reason they don't cast readily perceptible shadows. CFLs are an interim step along the way to affordable and fully-functioning LEDs. LEDs are coming a long way really fast and mark my words, by the time 2014 rolls around, CFLs will be obsolete. I totally agree about the CFL's days being numbered. We're spoiled here by the proximity of Cree contsantly a reminder for LED's. Much of our lighting for streets & parking is LED. BTW Ikea also incorporates daylighting in its self pick warehouse areas. Next time you're in the Tampa store, look up - lotsa skylights. They also did away with plastic shopping bags at checkouts & encourage their reusables. A $0.59 blue Ikea bag goes with us to the grocery every week! I'm clinging to my incandescents, hoping by the time 2014 rolls around, there will be decent alternatives. I have chandelier fixtures in dining rm, kitchen & foyer, & sorry, but all of the CFL candelabra bulbs I've seen are just UGLY. 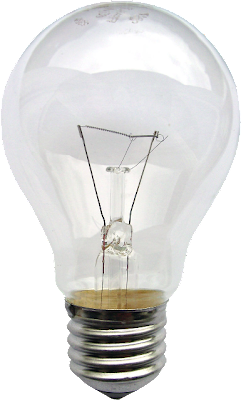 I swapped out other bulbs with CFLs, but it was before they came out with "instant on" bulbs, so I get annoyed waiting for bulbs to warm up & reach full brightness--particularly in my windowless powder room. One of these days I'll switch out old CFLs with new instant on CFLs...just another annoying piddley task to add to my list of things to put off. Also, I have several motion-sensor fixtures outside and in garage/basement, and from what I understand, CFLs don't do well with those. So until the marketplace addresses this consumer's aesthetic, functional (not to mention financial) objections, I remain enviromentally-incorrect for the time being. Sure thing Becky, IKEA may not the savior of the world but at least it's leading the way to a more energy-efficient world. Sarah: I'm waiting too, but the number of things I see every week give me hope for a future illuminated by LEDs. Sarah: You might want to start stockpiling those incandescents. They will go the way of camera film by 2018 or so. By then, LEDs will have come so far I doubt anyone will miss them. Anon: "Bad gases?" Of all the baseless reasons to dislike CFLs I think that's my favorite one. Care to elaborate? I'm not a huge fan of CFLs, but we do have them in all our exterior light fixtures. Inside it's still incandescents. I know, bad!! When we were in Luxembourg & Belgium a few years ago, it was CFLs everywhere. Europe is a lot farther ahead when it comes to being environmentally friendly, at least as far as lighting goes. So no, I don't think Ikea is phasing out incandescents too soon. We're already behind a lot of other places in the world here in North America -- it's time to catch up!! I doubt Mirabella are getting preferential treatment for being Australian made -- value for money trumps nationalism every time here! They're just cheap, and "win" on that basis. The Mirabella website claims they sell CFLs in 3 different marked shades. I've never seen a label on their packets before and I'll try a "warm white" out if I find one -- perhaps they are improving? Yes they are improving and keep your eyes open for the temperature in degrees Kelvin. While painting my eldest sister's apartment each time that I was in close proximity to a batch of these babies I would develop the worse headache which I am not proned to having. Vie process of elimination (glare, paint fumes, fatigue etc.) no one will convince me otherwise that 'these things' were the cause and can be detrimental to ones health. Needless to say, I am stocking up and hoarding every incandescent I can find.